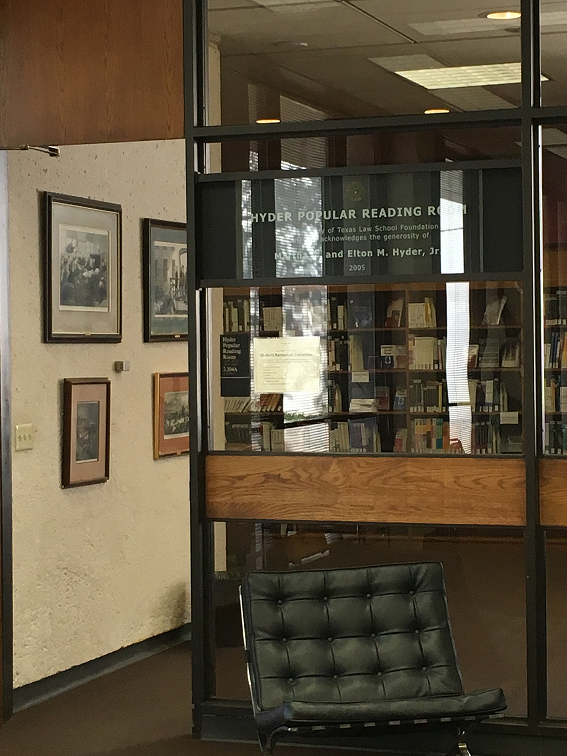 The Hyder Popular Reading Room gathers many of the most useful law student resources in one easy-to-access location. The room is located in the southeast corner of the second floor of the library. This collection features the most recent editions of our most popular study aids such as Hornbooks, Concise Hornbooks, Nutshells, the Understanding series, the Concepts & Insights series and the Examples & Explanations series, as well as titles on law school and career success. Although many prior UT law school exams are available online, bound hard copies of past exams are available in this room. There is also an informative display featuring the most recent issues of the twelve student run journals at UT Law. Please see our research guides for more information about Study Aids and Past Exams. Study aids circulate only to UT Law students and can be checked out for 3 days. Past exams are library use only. The Hyder Popular Reading Room also provides a quiet study space for individual or group studying.